Sophisticated & elegant this Leaf shaped Murano Glass Pendant self designed & painted in Multicolor of Purple combo fashionable hang from Amethyst nuggets neckalce. 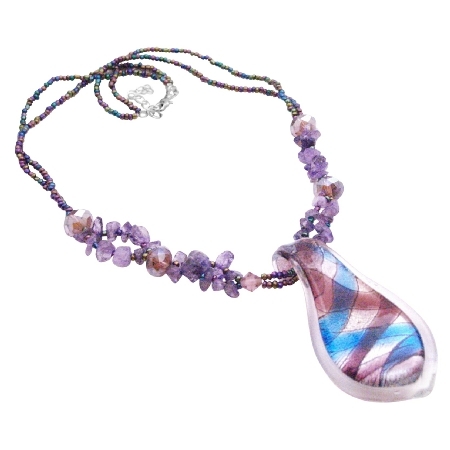 Is one of classiest items in our popular Murano Colori line of Italian glass jewelry. Owning & wearing a Murano glass pendant is like displaying a fine piece of art in brilliant colors. Still made in the traditional manner in unique style. Super Grade RARE HIGHEST QUALITY. Quality A to AA. It is the traditional Jewelry.This necklace is very popular gift for someone you love or special. Good shinning surface quality.